The way the sunlight shines through the water waves is soo damn cool. Awesome work! It took a while to get that right. Thanks! nice! It looks like it would be from a sci-fi movie. I love this, very relaxing if you look at it for some time. puts you right there. Great work! I would really like to get this as a print, what is in your opinion the best size and printed on which medium? I am honestly unsure as to why I have not commented on this before, considering this is probably my most favorite artwork from you (it inspired me to write one of my favorite projects, also). Anyway, I must say that this is absolutely extravagant, and it literally left me speechless the first moment I looked at it. I remembered once feeling so immersed in observing the art that it felt like I was actually there. I do wish a place like this could exist in such natural and spatial beauty. 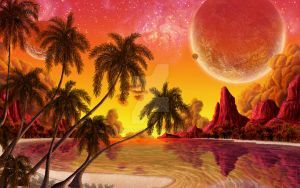 In all honesty, though, this is very realistic for a view of a tropical beach on an alien planet, unless the clouds are nebular gas and dust. Nevertheless, this is (in conclusion) incredible. I can understand how you would see it as standard, considering it is like the others in its series (along with the fact they are all supposed to be similar, as you said). 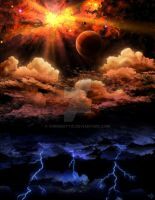 You certainly made the clouds look unique in that sense, and their various colors, along with how it was painted, remind me of Renaissance paintings of Heaven, in my opinion. This is Biblical and I so hope this is the way it is. Is it time we redid it? I have died and gone to heaven. This where I went. It's beautiful, because the brightness of the sun contrasts with the darkness of the island. Yes a lot of people seem to like this one the most. I think it's because it has a more intense difference between light and dark. Yeah, the intensity between them is immense. how can I has dis? You could add it to your cart..
Wow! Those waves! I wish I could paint waves likes that! I love the light coming through them, very well done! Yep, I always get disappointed when I install a new Vue and I see the same plants and trees from Vue5 (the first Vue I used) but the palms are of particular irritation to me as they're unusable up close (even at a medium distance they're a little dodgy looking!) even the bark looks ridiculous. Maybe it is just because we are in Queensland and surrounded by palms that we notice their inaccuracies more? Anyhoo, great work creating your own there. this is so incredibly beautiful. im sure you get this a lot but your work is FANTASTIC. would it be ok if i tried copying this as a color/environment study?? Very cool!!! I love the way you displayed the colors. It's magnificent! I'm at a loss for words! SOOOOOOOOOOOOOOO BEAUTIFUL!!! I LOVE IT SO MUCH!!! Hey! HEY! How'd you get a shot from my private island? !